ENS kalari Daily demonstration is started in 1991. So many visitors were already visited and experienced the spectacular show. E N S Kalari is demonstrating and teaching both Northern and Southern styles of Kalarippayat. This may perhaps be the only Kalari of this type in Kerala blending both the systems and conducting daily demonstration. The duration of the kalari show is 45minute to 1 hour and 6 to 7 warriors are participating in the Demonstration. The show starts with introduction of Kalarippayat. Kalari is decorated with traditional oil lamb and flowers. The performers perform the Kalari items accompanying by the traditional musical instruments, such as ‘chendamelam’, ‘panchavadiyam’, edaka and other musical instruments. The visitor will get opportunity to watch and handle the weapons of Kalarippayat. About 20 to 27 items are performing during demonstration. Duration of each item will be 2minutes. Explanation will be given between each item. So that the visitors were never forget the thrilling experience from his/her mind. The numbers of visitors are increasing in every year. About 600 peoples visited E N S Kalari last year. Every day Kalari demonstration is the most entaertaining programe started in 1990. Every day Kalari centre open with necessary rituals. Kalarippayat training starts at 5.30am to 6.30am and 5.30 pm to 6.30pm [MON-SAT]. Those who are really interest in Kalarippayat, they can use this opportunity. This is fully disciplined kalari practice of the disciples. Disciples practice kalari according to their capacity and capability. Visitors will under stand the disciple, spirit, and rituals of the training. Introductions about training will give by the Master or Gurukkal. Time of Watching KALARI TRAINING is evening 17.30hours to 18.30hours except Sundays. ENS kalari have a good out side demonstration team, it is lead by Sri. 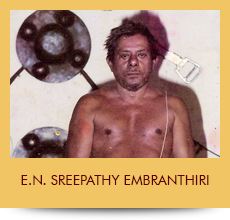 E.S.Narayanan Embranthiri the son of our late GURU and present Master. It is started in 1959 onwards. 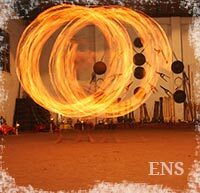 ENS Kalari demonstration team performed almost all the places of India and South Africa. The 50mts. to 1hour programme are present by 6 to 7 artists accompanying by a traditional instrumental music. Each item will present after the announcement About 20 to 29 items are presenting in the venue. This year onward the visitors can purchase the Kerala’s traditional musical instruments Audiocassettes, VCD of ENS Kalarippayat, Kalari weapons [demy], Kalari post cards, and Kalarippayat books from ENS Boutique. Which is near to ENS Kalari centre.